THE SKINNY: Halloween came early for me this year. Obsessive Compulsive Cosmetics Lip Tar: Matte in Black Dahlia is a lip color that asks not to be judged by the color in the tube. It's difficult to apply and keep from looking messy. The consistency is a bit drippy even. And it sticks with you. The "tar" formula is almost a stain and the color stays for hours after application (and even attempted removal). It's supposed to have a lot of moisturizers but the sticky goo was too much for me to leave on for any extended period of time. KEEP OR TOSS: Toss. Unless you are using it for dress up or typically wear very dark lipstick. 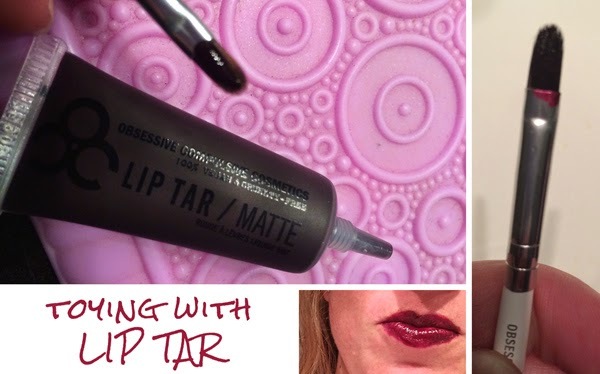 CHECK IT OUT: Obsessive Compulsive Cosmetics Lip Tar comes in more than 40 shades.